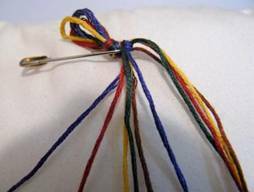 Also known as an "arrow" friendship bracelet, the chevron friendship bracelet pattern is one of the first most new floss bracelet makers learn. You work this bracelet from the sides inward. Once you "get" how this works, you are halfway to making just about any diagonal friendship bracelet pattern. The chevron can be made using at least two colors or as many as you would like. This pattern calls for five colors: blue (1), rust (2), yellow (3), green (4), and brown (5). Instructions for the knots, starting, and finishing are here. Cut 1 strand of each color to desired length. For this particular pattern, 50 inches will produce approximately a 5 inch (including loop and knot) tight bracelet. Fold strands in half and make a loop and knot at the top. Pin the knot to your workstation pillow. Arrange colors: 12345 54321. The outer strands (blue) will be used first. Starting on the right and using the outer-most strand, make four backward-backward knots, one on each strand in from the right, until you reach the middle. So you know 1BB on the red, 1BB on the yellow, 1BB on the green, and 1BB on the brown. You've done half of one row. From the left with the outermost-strand, (in the picture, this would be the blue on the left) make five forward-forward knots. 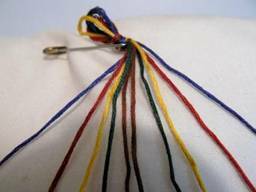 1BB on the left red, 1BB on the yellow, 1BB on the green, 1BB on the brown, and the the 5th BB knots onto the other blue strand. This fifth knot joins the blue strands together. They which should both now be in the center. The color arrangement will be 23451 15432. Your next left most and right most strand is red. Continue steps 4a and 4b until you reach the desired bracelet length. The picture below shows what it looks like after knotting the brown row. Finishing: Divide the strands into two sections, and braid each group. 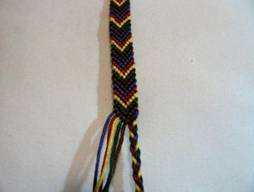 As I said in the introduction, this chevron friendship bracelet pattern gets you halfway to making different bracelets. The other to learn is the "inverse" chevron bracelet, which teaches you how to move outward from the middle. If you know how to move inwards and outwards, then you can make diamonds, X's, and zigzags. Or make a bracelet with a combination of everything.